​​Join Christine for her 2019 Mother's Day Dinner Special! 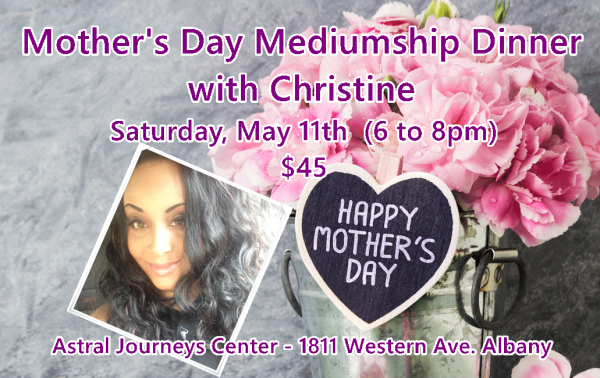 Dinner will begin at 6pm, immediately followed by 1.5 hours of Mediumship readings. Christine will connect you with your loved ones. Christine will get to as many guests as possible (everyone will not receive a reading). Making connections not only with Moms but also all your family and friends on the other side. Now that we have moved into the new building we now have space to do wonderful events like this. Click on the photo to purchase your tickets! Lisa Williams will be teaching a Forensic Mediumship Class August 2nd-4th at Astral Journeys! If you are a psychic or Medium and you would like to take a class with a world class medium then do not miss this event. Class size will be limited! Friday August 2nd, Lisa will be doing a private demonstration in our classroon for the general public from 7:30-9:30pm. Tickets will be going on sale for that shortly. There will be some special meet and greet tickets available for this event also. Lisa is my teacher and mentor and I must tell you I am thrilled that she is coming to Albany to do this for my Center!